They say you shouldn’t go to bed angry. But last night, I did. I went to bed angry with a laundry list of people, including Aaron Boone, Luis Severino (especially after I apologized for trashing him before the Wild Card game), Lance Lynn, Giancarlo Stanton and, of course, umpire Angel Hernandez. Funny enough -- not Austin Romine; he’s a catcher, and he truly did the best he could given the dire situation. But once I got into bed, I began my ritual of falling asleep to a television show I’ve seen many times before (not the replay of the postgame, because ugh), and of scrolling through Twitter. 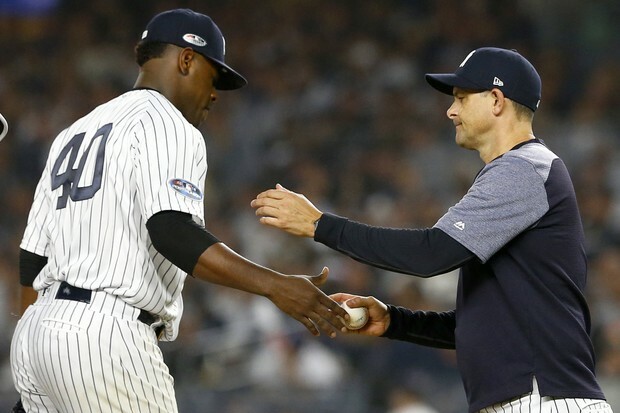 Was it not just last year that the Yankees came back to win an American League Wild Card game following less than 1.0 IP from the same Severino we saw last night? Clutch hitters who performed in that game -- perhaps most notably, Didi Gregorius, who hit the three-run home run to keep the Yankees in the game -- will also be in the lineup tonight. Gary Sánchez may not have delivered last night, but should we fans forget his Saturday evening performance in Boston as quickly as we celebrated it? He’ll be in the lineup too, and there’s always a chance (even not against David Price) that he’ll hit another 479-foot bomb. In fact, it’s probably more likely in Yankee Stadium, where the Green Monster isn’t a Thing. And then, there was last year’s ALDS, in which the Yankees were down 0-2 heading into Game Three, and came back to win three straight games and, as a result, the Division Series. Yes, okay, it was against the Cleveland Indians (who were just swept by the Houston Astros in this year’s episode of the ALDS), and not the Red Sox, but postseason baseball is still postseason baseball. The odds were even more against the Yankees last year than they were when I went to bed last night. Whoever thought that the Yankees would come back to defeat the Indians by winning three straight games? I didn’t. C.C. Sabathia is a veteran. He’s been here before, and he’s been here many times, even if not with the Yankees. Yes, he can’t go deep into games anymore. Yes, he’s 38 years old. Yes, he’s faced a number of D.L. stints. Yes, his 2018 regular season ERA of 3.65 is nothing to write home about. But he’s still C.C. And he’s been around for 17 years. Of those 17 years, Sabathia has seen six Yankees postseasons (if you count 2015). He’s often credited as a “big game pitcher.” And his success doesn’t just come on the field; it also comes in the clubhouse. 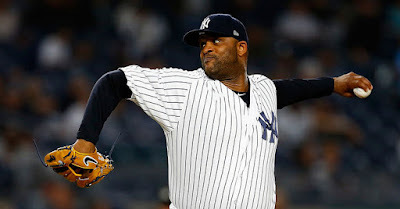 The “Baby Bombers” see Sabathia as a mentor, and while this outlook is much more emotional than based in facts or stats, the team could potentially come together to rally around Sabathia in what is possibly one of the last postseasons of his career. Fans have heard the rallying cry of the deficits in the Red Sox bullpen throughout the entirety of this series so far. As evidenced by last Saturday night, the Red Sox used five relief pitchers after Price went just 1.2 IP. Of those five relief pitchers, not one went more than 2.1 IP, with Brandon Workman going just 0.1. They allowed a combined total of seven strike outs. Let me say it louder for the people in the back: five pitchers allowed seven strike outs over eight-plus innings. So, what was part of the problem last night? The Yankees couldn’t get to the bullpen in time. The offense couldn’t take Nathan Eovaldi out of the game quickly enough. The damage was already done, and Eovaldi went 7.0 IP… why would Alex Cora take him out of the game at that point? If the Yankees manage to yank (pun intended) Rick Porcello out tonight after just a few IP, chances are, they’ll make the Red Sox use their ineffective bullpen. … which brings us back to Romine. A majority of the members of this team will do whatever it takes to win, even if it means coming out of the dugout, when you’re a catcher, to pitch, because your teammates can’t finish the job for one unfortunate reason or another. Aaron Judge will hit home runs. Aaron Hicks will make a return to the lineup, just days after an injury. Brett Gardner will make a start, in spite of both his age as well as a mediocre season. Gregorius will give 110 percent, as per usual. Regardless of whether or not you agree with Aaron Boone’s moves or lineup choices, every single Yankee on tonight’s roster has the potential to make something miraculous happen. It’s difficult to rally when you’ve been beaten 16-1. But no matter what last night’s score came out to, a loss is still a loss, even if it was 2-1. The Yankees would still be facing elimination tonight. That said, it’s hard to get out of your head when you’re on the brink of elimination. But tonight’s elimination is not new territory for this Yankee team. Did they not just win a one-game Wild Card play-off? Yes, it’s the Red Sox. But after all… haven’t the Yankees faced them 19 times this year? Nothing here is insurmountable. And for that reason, us fans can’t give up on our boys. They may be down, but don’t count them out just yet.